This course is dedicated to people who love top thick quality products and are able to pay for top of the range products. Concentrated products is the best value for money because the products must be diluted due to the strength of the product. People appreciate thick concentrated products because it is value for money. Quality Concentrated Thick Formulations and Training in this package provide 5 different streams of income. Thick Concentrated products are suitable for higher income households. 4. Manufacture Thick Concentrated Handi Andi ('Handy Andy'). 5. Added to this package is Quality Thick Pine Gel. 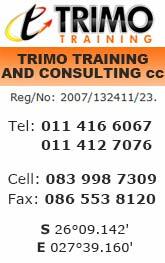 Thick Concentrated Detergent Manufacturing Course in Randfontein. Course Dates: 10 May 2019. If you are considering a starting a business in selling domestic cleaning products then our detergent manufacturing course at Trimo Training and Consulting is precisely what you need in order to propel your idea, and new business, into action. Making detergents is something that requires some background knowledge and know-how. You cannot expect to just know what to do and this is why our workshop is designed to teach you how to make the best detergent on the market, and to make it available to your clients at a cost effective rate. After completion of our course you will be able to effectively and accurately manufacture Concentrated Thick dishwasher detergent, thick concentrated bleach, thick concentrated fabric softener, and thick concentrated Handi Andi and Quality thick Pine gel. Detergent distributors with the correct training, simple formulas and the right detergent chemicals at hand will be able to present affordable products to the market that everyone will appreciate. Our course content is quite detailed, but our training manuals are simple enough for anyone to understand. Detergent ingredients and formulas are provided to you in your study manual in recipe format, and you can refer to these even after your course is complete. How long will the course take? You are looking at spending just 1 day with us at our premises in Randfontein, Johannesburg. We have facilities and free basic accommodation available to those who are travelling from out of town. When taking on the course you will learn about manufacturing products that typical detergent buyers are looking for. You will be provided with 2 training manuals. The first one will focus on dealing with chemicals, health and safety precautions, labelling requirements by law, quality control and sample testing, storage requirements, using preservatives and dyes, maintaining the correct PH levels, thickening your products, working with percentages and more. This manual will cover all of the raw materials, tools and techniques required to run a successful business of this type. You will find that there is an item of equipment required that you can make up yourself – we will teach you how. Alternatively you can order detergent mixers from us which we make available to our students at a cost effective rate. The second training manual focuses on developing your basic business and marketing skills. Branding and acceptable mark-ups will discussed along with packaging, market research, advertising avenues, customer service, tendering options and procedures, tax, VAT and UIF and so on. You can expect for the detergent manufacturing course at Trimo Training and consulting to fully prepare you for what the soap and cleaning products market has to throw at you. This type of business is ideal for the entrepreneur looking to start their own home business. It will require very little in terms of space – a double garage should be fine and you will find that the overhead costs are kept to an absolute minimum. Book your space on our next course and prepare to learn skills that can set you free financially in the very near future. Apply for the Thick Concentrated Thick Detergents Course Here.